ERG is a col­lab­o­ra­tive com­mu­nity of grad­u­ate stu­dents, core fac­ulty, over 150 affil­i­ated fac­ulty and researchers across the cam­pus, and over 500 alumni across the globe. Our stu­dents work­ across dis­ci­plines and depart­ments to cre­ate poten­tially trans­for­ma­tive knowl­edge for the planet. 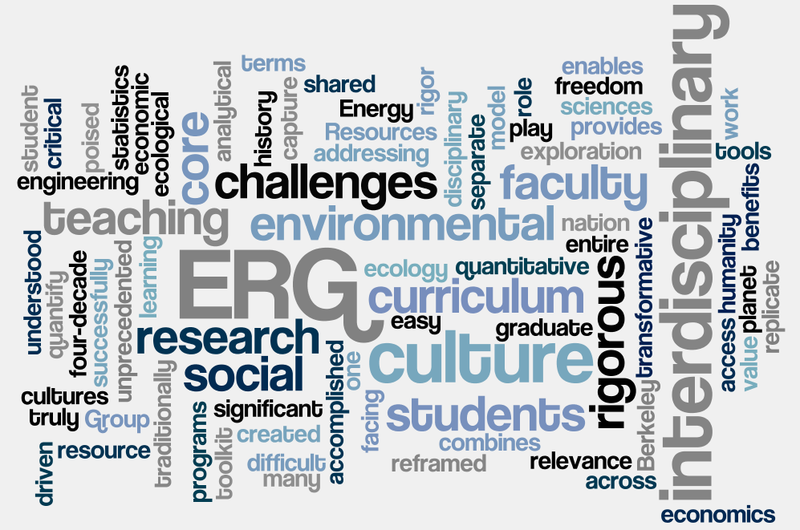 ERG is a world-renowned pro­gram with a 40-year his­tory of out­stand­ing research, edu­ca­tion and outreach to gov­ern­ment, indus­try, and civil soci­ety at the state, national and inter­na­tional levels. The mission of the Energy and Resources Group is to provide education and research for a sustainable environment and a just society. With its four-decade his­tory of trans­for­ma­tive teach­ing and research, the Energy and Resources Group (ERG) has reframed eco­log­i­cal and social prob­lems in terms that bor­row from, and yet can be under­stood across, many tra­di­tion­ally sep­a­rate dis­ci­pli­nary cul­tures. The ERG model com­bines a rig­or­ous core cur­riculum, a shared learn­ing environment, and the free­dom to access the entire Berke­ley fac­ulty. The core cur­ricu­lum pro­vides stu­dents with relevant ana­lyt­i­cal tools from ecol­ogy, eco­nom­ics, engi­neer­ing and the social sci­ences. ERG research is strongly evidence-based and hypothesis-driven; its inter­dis­ci­pli­nary culture equally encourages student‐ and faculty‐led research. The value of such a cul­ture is hard to quan­tify: it has evolved through the commitment to systemic thinking, and the vision of a just and sustainable planet, over generations of ERGies. devise technical and policy alternatives to unsustainable energy and resource use patterns. The Berkeley Campus offers exceptional opportunities to learn from outstanding scholars in many disciplines. ERG facilitates the placement of specialized knowledge into the larger integrated perspective. Students and faculty incorporating one another’s insights, work on alternative energy technologies, ecological economics, terrestrial ecology, environmental justice, resource conflicts, and society and technology. ERG and the term “activist-scholar” are closely associated: Faculty and students alike are motivated by current and foreseeable problems and are encouraged to take what they learn into the full range of educational, political, and policy processes. In this highly interactive academic environment, feasible paths to social justice, appropriate technologies and ecological integrity begin to emerge. ERG traces its origins to the Committee on Energy and Resources, which was established in November 1972 under the chairmanship of electrical engineering professor C. K. Birdsall as an Advisory Committee to the then Vice-Chancellor Mark N. Christensen. The Committee laid the groundwork for an interdisciplinary program of teaching and research in energy and resources and secured for this purpose the first regular faculty position in Berkeley’s history to reside entirely in an interdisciplinary unit. John P. Holdren (emeritus) was appointed to fill that position, as Assistant Professor in the Energy and Resources Program, in summer 1973. The program attained degree-granting status as a Graduate Group in late 1974, and admitted its first graduate students in 1975.